Standing back from the detail it is possible to offer a simple summary of the main defensive and occupation sequence of Danebury Ring based on the east gate stratigraphy which will be used throughout this book, as shown in Table 1. The middle earthwork, which defines an elongated enclosure between the two entrances on the southern side of the fort, was sectioned in 1969 and found to consist of a simple dump-constructed rampart fronted by a V-shaped ditch. No dating evidence was recovered but at the east entrance it was possible to show how the middle earthwork turned towards the main fort ditch and topped, leaving space for a track to branch from the entrance round to the enclosure. When the hornworks were begun in period 5 the entrance to the enclosure was blocked. If a similar sequence occurred at the south-west gate, then the enclosure would have been completely isolated. There are, however, two undated gaps in the earthworks which could have been made at this time to allow cattle and sheep to continue to be driven into the safety of the enclosure. The date of construction of the middle earthwork is undefined but it must pre-date the refurbishment of the rampart in period 3. So far, then, we have been able to build up a relative sequence for the defences based partly upon the evidence obtained from the excavation and partly upon observed relationships between the various earthworks. There are two more stages to be accomplished before it becomes possible to consider the development of the Danebury community in relation to contemporary societies: first the defence sequence must be projected into the settlement itself and an atten1pt made to divide the various elements of the settlement into their different phases, and second, the sequence must be dated. Assigning the pits, post-holes and gullies of any prehistoric settlement to their correct chronological phases is an extremely difficult task unless there is some surviving stratigraphical evidence. Ideally that evidence would consist of superimposed layers. 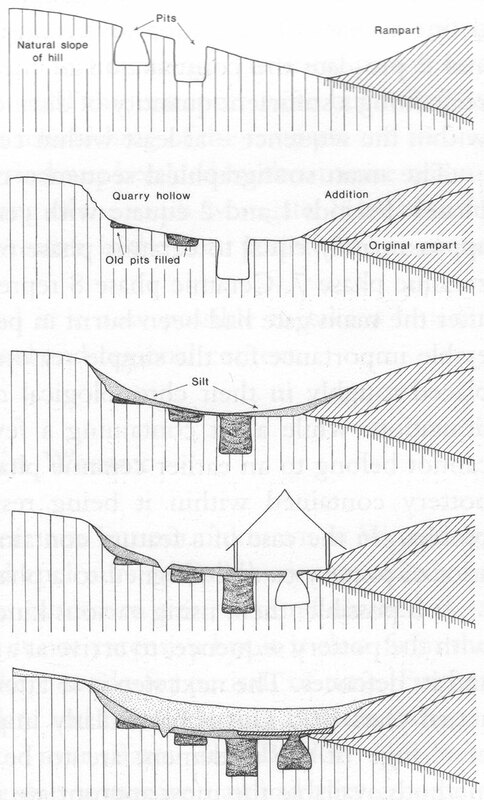 A pit sealed by a layer of road metalling which in turn is cut by the post-holes of a building allows pit, road and building to be put into their correct chronological sequence but without the road metalling, unless the post-holes of the building actually cut into the top of the pit, it would be impossible to say whether pit or posts were the earlier. It is very unusual to find stratified layers on prehistoric sites in Britain and therefore it is usually the physical relationships of features, or the relative date of material contained in them, that have to be relied upon to produce some hazy idea of site development. When features are widely spaced and datable finds are sparse there is comparatively little that can be said. At Danebury Ring we were particularly fortunate to have exceptionally well­ preserved stratigraphical evidence. The most comprehensive sequence was preserved immediately behind the ramparts where conditions were such that layers accumulated quite quickly: a floor level laid in the protected area close to the rampart tail tends not to be worn away by erosion but instead is sealed, and thus preserved, when violent storms wash down layers of silt, or when additional material is piled on to the rampart. Even better preservation was found in the quarry hollows around the north and east side of the fort (image 11 and video 01). Image 11 – Simplified diagram to show the succession of layers behind the rampart. Stage 1 represents the early period (ramparts 1 and 2). In stage 2 the rampart was greatly increased in size with material dug from the quarry hollow, and storage pits were dug into the bottom of the quarry. After a period of silting (stage 3) a house was built (stage 4). After occupation had ceased the quarry silted completely. Wherever they have been examined, the quarry hollows have produced evidence of ten or more phases of activity incorporating the structural remains of superimposed houses together with their floor surfaces, hearths, ovens and their contemporary pits. In favoured situations like this it is possible to produce phase plans of the settlement over more than three centuries. Many clues have to be pieced together to help construct a picture of the sequence. One particularly valuable observation, made in the southern part of the site, illustrates the point well. In this area two parallel road lines were observed, running more or less concentrically with the rampart, both of them flanked by rows of rectangular buildings constructed of settings of four and six posts. Clearly, this represented a major phase in the organisation of the settlement plan. Fortunately in one place it was possible to observe that several of the buildings were related to the layers preserved behind the rampart in such a way as to show that the buildings were put up soon after rampart 3, and thus belonged to the later occupation. The layout of the roads and construction of the buildings can therefore be seen to be part of the major reorganisation of the fort involving the massive reconstruction of the defences. In the central area of the fort away from the stratified layers behind the rampart large numbers of pits and even larger numbers of post-holes were found cut into the chalk but without any linking stratigraphy. To attempt to fit these into their phases it was necessary to rely on the artefacts found in them, in particular the pottery. Here again Danebury is favoured because pottery is prolific and in Wessex at this time it changes quite rapidly in style and decoration. By establishing the main stages in this development we were able to define a series of nine successive ceramic phases (Table 2) of which periods 1 and 2 pre-date the construction of the first rampart. Pits and other features containing a sufficient quantity of distinctive pottery could therefore be placed within the sequence – at least within certain broad limits. The main stratigraphical sequence can be directly related to the ceramic phases. Periods 1 and 2 equate with ceramic phases 3-5, periods 3 and 4 are approximately equal to ceramic phase 6 while periods 5 and 6 run parallel to ceramic phase 7. Ceramic phase 8 represents the last organised use of the site after the main gate had been burnt in period 6c. This correlation is of considerable importance for the simple reason that it enables isolated features to be placed roughly in their chronological context. There is, however, a general limitation: while a pit containing a few sherds of ceramic phase 4 pottery cannot belong to an earlier ceramic phase, it could belong to a later one, the problem in the case of a feature containing little material, but one producing a lot of pottery can be assigned to a phase with more certainty. It is possible, then, using various kinds of stratigraphical evidence, together with the pottery sequence, to arrive at a phased development of the settlement and its defences. The next step is to attempt to calibrate each stage in terms of actual years BC. This is particularly important if questions involving the rate of change of the settlement are to be considered. Of the various possible methods available the most appropriate is radiocarbon dating. More than 70 samples of organic material were taken so that a range of statistical tests could be applied to the dates they provided. After careful assessment it was possible to arrive at the following absolute chronology for Danebury Ring as shown in Table 2. Table 2 – The dating of the phases at Danebury. The terms early, middle, late and latest, set out here, will be used from time to time throughout the following discussion to simplify the narrative. In terms of the overall history of the site they have real meaning. The early period saw the creation of the hillfort and its use until the entrances were burned. The middle period began with the symbolic refurbishing of the ramparts and reconstruction of the gates, while the late period was heralded by the massive reconstruction of the ramparts and the blocking of the south-west gate. It lasted until the main east gate was burnt down. Thereafter, in the latest period the use of the old site was sporadic. Given this simple ‘historical’ model it is now possible to take a broader perspective and see Danebury Ring in its local and regional context.